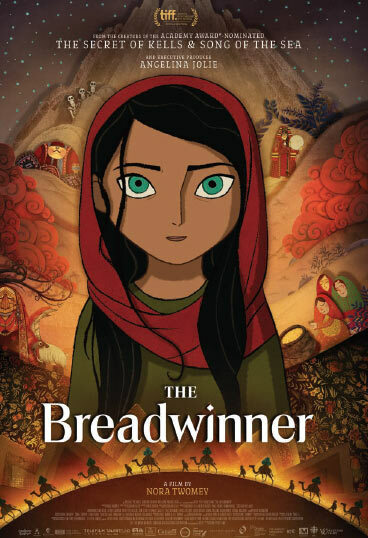 Based on the children’s novel of the same name by Canadian author Deborah Ellis, The Breadwinner is a timely and moving animated tale for both kids and adults, which has been lovingly brought to the screen by director Nora Twomey with the help of Angelina Jolie, who serves as an executive producer. This is the story of Parvana (Saara Chaudry), an 11-year-old girl who is living under the fierce rule of the Taliban in Afghanistan, spending her days selling things at the market with her father Nurullah (Ali Badshah). Nurullah is a former teacher who has taught his daughter how to read and write, in a country where girls aren’t allowed to do these things let alone succeed, and he is determined to let her have a normal childhood, instead of being married off to an adult man like so many other girls her age. When her father is arrested by the Taliban, because the fact that he is telling stories is considered “haram” under Islamic law, Parvana cuts her hair and starts dressing in her late brother’s clothing, passing herself off as a boy so that she can leave the house without a male chaperone and actually get work. She starts making money to provide for her depressed mother (Laara Sadiq) and siblings, hoping that she can reunite with her father, but her secret can only last so long under the oppressive regime. Crafted by a team of hundreds of artists at Cartoon Saloon, an Irish animation studio that also gave us the two Oscar-nominated gems The Secret of Kells and Song of the Sea, The Breadwinner comes alive through gorgeous 2D animation, utilizing a mix of both digital and hand drawn elements to visually impressive ends. The film intertwines its main narrative with a mythical story being told by Parvana, and these sequences are distinguished by their paper cut-out animation style, and are just as visually sumptuous to watch. The film masterfully uses its wonderfully stylized animation to tell a deceptively simple yet incredibly powerful female empowerment story, that is richly layered in how it explores deeper social issues, doing so in a way that is accessible for young audiences to understand. The result is a timely and gorgeously crafted work of art, that carries with it something for those of all ages.